For foodies who are traveling overseas, Michelin-starred restaurants are not the only choice available when it comes to experiencing the local food culture. Many, thirsty to know more about everyday local cuisine, take advantage of culinary tourism, joining cooking classes or food tours. Taking some time off from wandering the streets, tourists are immersing themselves in authentic local experiences, under the guidance of professionals. Kim Tae-yeon, the chef-instructor of O’ngo Food Communication explained to the class while showing them how to cook kimchijeon. The four students of the day gathered around the frying pan to take pictures. 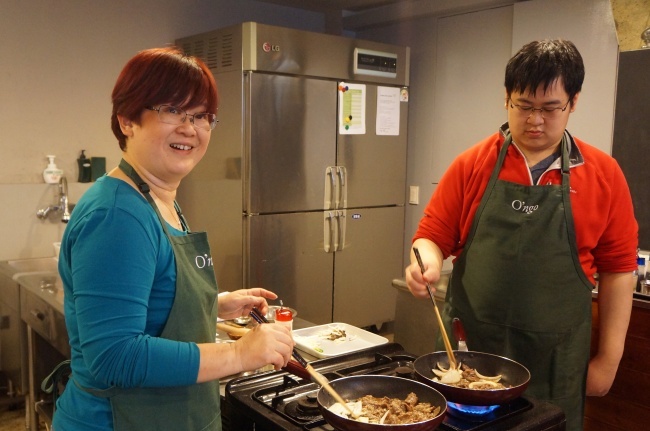 At O’ngo, various cooking classes, tailored to each visitors’ needs, are prepared. Outlanders can take beginner, intermediate or advanced level classes, depending on their understanding of Korean food. Halal classes, designed for Islamic tourists, are also offered. The 70,000 won ($65) class took place at a spacious cooking studio near Anguk Station, at the center of Seoul. Four foreign tourists, who just arrived in Korea, rolled up their sleeves to cook bulgogi (sliced and seasoned beef) and make kimchi. All ingredients needed for the day were already measured. The class started to season the beef needed to make bulgogi. Before starting, the instructor cordially asked the attendees about their previous encounters with Korean foods. Detailed recipes in English were placed on the cooking tables. As the passionate students worried about how to buy the local ingredients back in their home countries, the chef explained what could be used as counterparts. Chef Kim moved on to explain Korea’s kimchi culture. As she told the students that many local households have separate fridges for exclusively storing kimchi, the participants posed more questions on the subject, surprised by the nation’s love for the fermented dish. “There are more than 100 types of kimchi, depending on the ingredients and the manners of making it. Families gather in early winter to make large amounts of kimchi, from 50 to 200 cabbages,” the chef said. As the tourists experimented with the ingredients, an assistant instructor took away the used utensils and dishes, enabling them to cook in a more convenient manner. She also, took photos of the students while they are cooking, for the memories to last forever. After the class, the participants gathered at a large table to enjoy the results of the day. Tasting the dishes, they talked about the exquisite culinary experience. 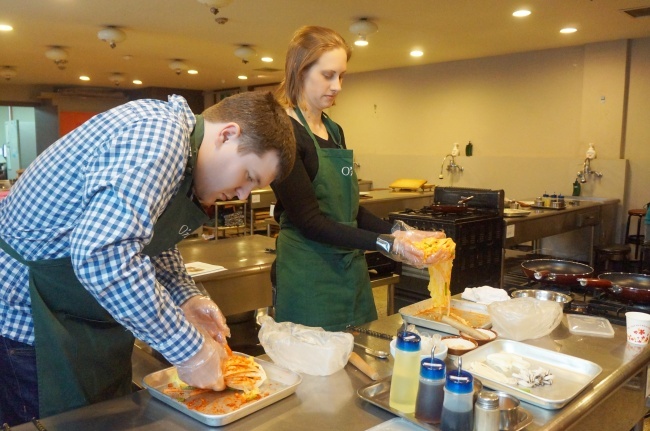 “Without taking the class, we wouldn’t have known the stories related to the dishes. We can eat them outside at ordinary restaurants, but without knowing the cultural backgrounds,” Toh said. As the tourists left to continue their journey of Seoul, they took the kimchi that they had made. The instructor, packaging the kimchi, told them to wait at least three days for the cabbages to be properly fermented. 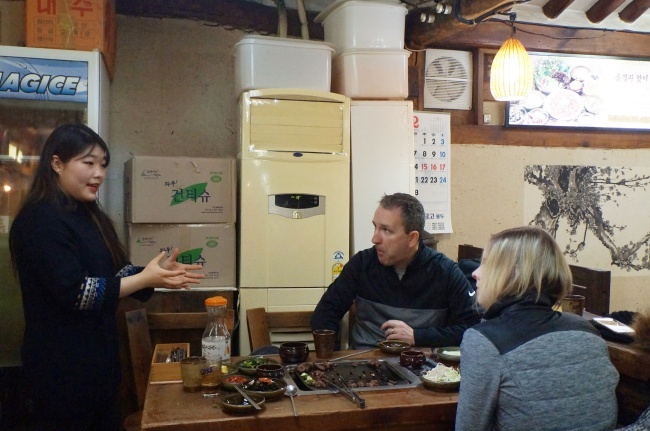 To know what the average Korean eats and drinks, foreign tourists can take arranged food tours, visiting four different eateries without getting lost or not knowing what to order. At 6 p.m., five tourists and a food curator kicked off their food journey on the streets of Insa-dong, a traditional district with Korean antiques. According to the O’ngo manager’s explanation, the tour, which costs 90,000 won, is designed under the concept of “hoesik,” a dinner with co-workers in Korea. The tourists, unable to hide their excitement for the night ahead, asked questions about Korean culinary customs. “When we go to new places, we always join food tours. Through a local’s guidance, we learn what to order, how to eat and even the culture,” a participant from Germany, Volker Homburg said. At the next restaurant, the group dived into a typical Korean college experience, tasting tteokbokki (stir-fried spicy rice cake) with fruit soju (Korean liquor). As the menu was quite spicy for the outlanders, they tried to tame the heat with the sweet plum soju. On the way to the third place, the gourmet curator explained that they are walking through the Pimatgol Alley. “In the past, people found it bothersome to bow to the royals on the big streets. Also the royals’ horses and carriages were threatening. So they walked through this alley, to avoid them,” she said. 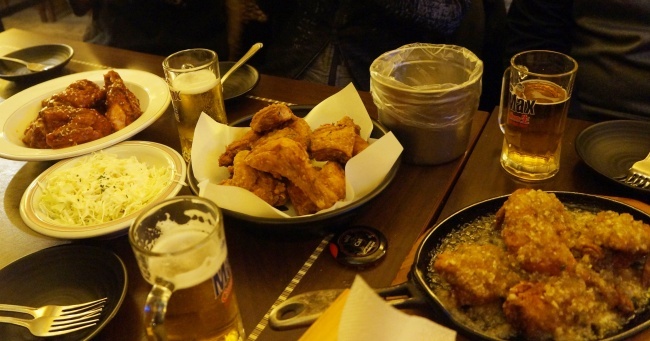 The third cuisine was reflective of Korea’s modern days -- fried chicken and beer. While the menu itself might seem too general, as it can be found around the globe, the combination receives an exceptional welcome in Korea. The tour wrapped up at Gwangjang Market, one of the largest traditional markets in Seoul. After tasting Korean pancakes and makgeolli (Korean rice wine), the tourists expressed their liking for the traditional alcohol. Indulging in a food coma, the group left the market, ready to head back to the hotels. The food curator promised to send the pictures taken on the day via e-mail. The great journey of Korean culinary was over, but the participants were confident that they can walk into other restaurants knowing what to do from today’s lesson. Other culinary experiences for foreign visitors are available. OME Cooking Class takes guests to local market tours in the morning before the classes start in the afternoon. The participants can cook four to five dishes. The menus differ every day. The class costs 60,000 won per person. Korean dessert class is also offered at the same price. Visit 5tastes.modoo.at for more information. For those who are seeking for more private cooking classes, Janet’s Cooking Studio may be the answer. As the classes are private, Janet, the Seoul-native chef is ready to offer adjusted menu choices for special dietary needs. The private classes which takes four to five hours costs 110,000 won. The chef also hosts a three-hour food tour at eateries in a local market. The tour includes tasting sweet local snacks and sampling traditional Korean liquors. Visit www.janetscookingstudio.com for more information. At Korea House, ran by Korea Cultural Heritage Foundation, visitors can go a step further than just experiencing the cuisines. Apart from making the famous bibimbap dish, they can wear hanbok, traditional Korean clothing. Also traditional performances are prepared. 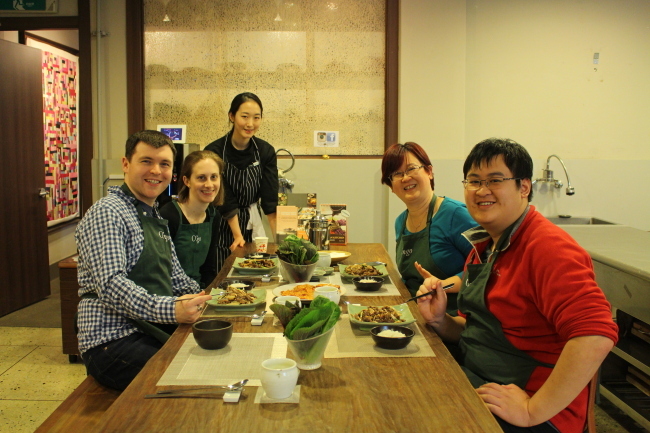 The cooking class takes place at a traditionally built Korean house. Costing from 55,000 won to 70,000 won, reservations can be made through https://www.koreahouse.or.kr. 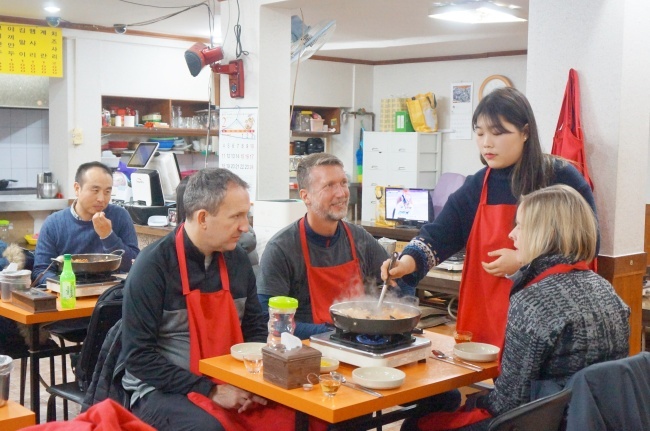 Korea Temple Food offers foreign visitors cooking classes under the slogan of “You are what you eat.” Strictly restricting the usage of meat, the classes aim to teach more than how to cook Korean foods. Students will be able to learn moderation and value of foods. Visit www.koreatemplefood.com for more information. Those who want to burn the calories off can join Super Tour Korea’s “Moonlight Seoul Tour.” Amid visiting local markets and tasting the local gastronomies, the tourists will ride along the Han River at night. The highlight menu is the chicken and beer combination enjoyed at a riverside park. The tour takes approximately four hours with a 20-kilometer ride. The price is 59,000 won and can be reserved through www.supertourkorea.com.